I’m looking for a list of discussion topics for a panel discussion that’ll happen at DAC in June. It’ll be a very informal/interactive session. We’ll take a list of topics and cycle through them in a series of 5-10min discussions. Audience will be encouraged to participate; agreeing or disagreeing as they see fit. I’m looking for topics to get discussion rolling and am hoping you’ll chime in with your ideas. 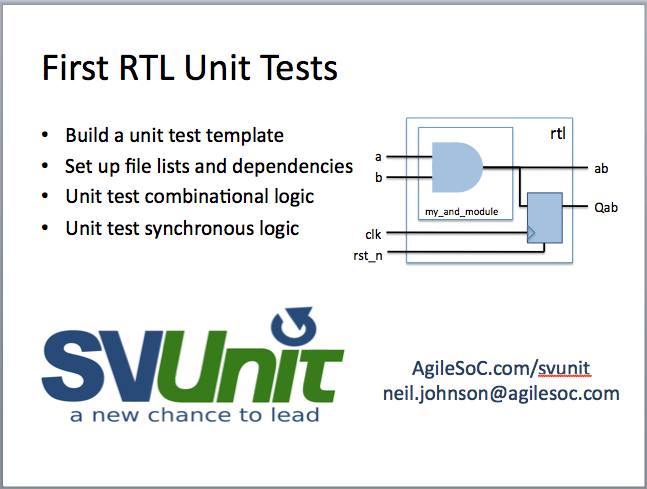 So if you’ve got a few minutes, I’d appreciate you joining the google group discussion and dropping a few comments or questions regarding unit testing, test driven development, SVUnit and/or related. As many as you can think of. Topics could be for or against unit testing, doesn’t matter. In fact the tougher the topic, the better! I’ll take 10-15 and and quote them in a series of slides. We’ll show the slides and invite the audience to weigh in.